We’re still sticking pretty close to our pescatarian menu, with one seafood and three vegetarian dishes this week. We’re going to the Harlem EatUp on Sunday afternoon and we’re excited to try food from all sorts of fun restaurants like Red Rooster, Miss Mamie’s Spoonbread, Harlem Tavern, and The Cecil, not to mention Make My Cake, the fantastic bakers that made the red velvet cake we had at our wedding. We’ll try and maintain some semblance of self-control at the event, but we have a sneaking suspicion that we won’t be very hungry when dinner time rolls around. We’ll probably just have some cheese and bread and maybe a little wine. 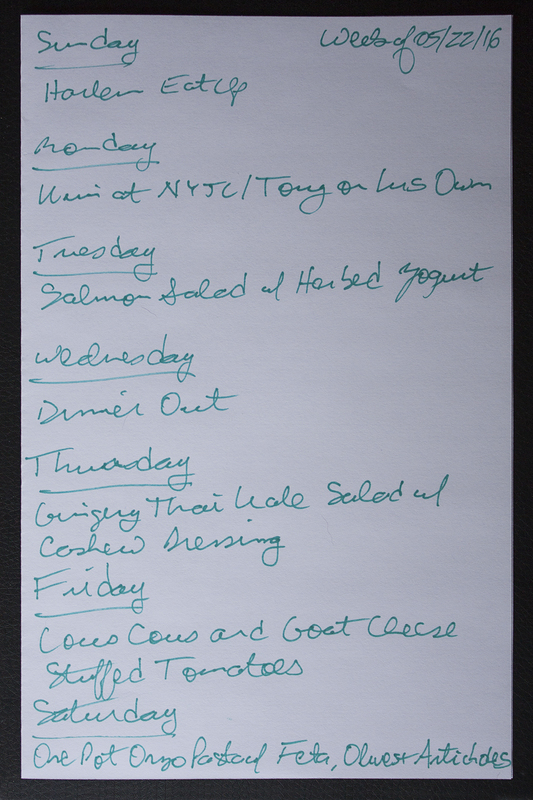 Kim will be at a Junior League meeting on Monday, so Tony will be on his own, but on Tuesday night, we’ll have Real Simple’s Salmon Salad with Herbed Yogurt. We’ll pair this up with a 2014 Sevre et Maine Muscadet recommended by our friend Michael at Columbus Wine and Spirits. We have a family event Wednesday night, so we’ll have dinner out, but we’ll be back in the kitchen on Thursday night making The Minimalist Baker’s Gingery Thai Kale Salad with Cashew Dressing. We thought we could stump Michael with this recipe, but he found a 2011 Pierre Richard Cotes du Jura. We’ll be making two recipes from The Kitchn to close out the week. On Friday night we’ll make Couscous and Goat Cheese Stuffed Tomatoes and on Saturday night we’ll have One-Pot Orzo with Feta, Olives, and Artichokes. Both recipes are fairly easy to make, so we’ll have plenty of time to enjoy dinner. We’ll have the tomatoes with a 2014 Vivanci Rioja Blanco and the orzo with a 2014 Domaine Sigales Assyrtiko-Athiri Santorini.